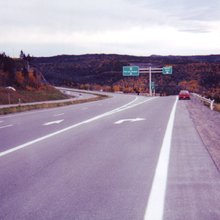 Highway 17 proceeds east from Nipigon for 581 km (361 mi) along the northern and eastern coast of Lake Superior. Between Wawa and Sault Ste. Marie the highway crosses the Montreal River Hill, which sometimes becomes a bottleneck on the system in the winter when inclement weather can make the steep grade virtually impassable. At Sault Ste. 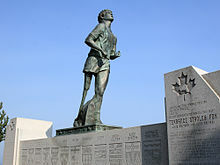 Marie, the main route turns eastward for 291 km (181 mi) east to Sudbury. 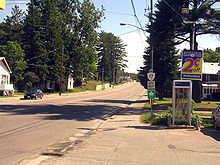 The Trans-Canada Highway splits again at the junction of Highways 17 and 69 on Sudbury's Southwest and Southeast Bypasses. 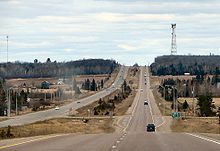 The southern route follows Highways 69 and 400 south for 254 km (158 mi) and then Highway 12 for 27 km (17 mi) to Orillia (where the TCH briefly follows Highway 11 a second time where Highways 11 and 12 run concurrent), a further 58 km (36 mi) along the shore of Lake Simcoe, before following Highway 7 east for 70 km (43 mi) to Peterborough. The mainline route continues east for 151 km (94 mi) to North Bay. The northern route rejoins the mainline here, which continues 339 km (211 mi) to Ottawa. 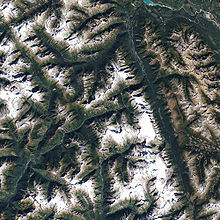 where the main and southern branches reconverge 244 km (152 mi) east of Peterborough. In Southern Ontario, the speed limit is generally 80 km/h (50 mph) on the Trans-Canada, while in Northern Ontario it is 90 km/h (56 mph). 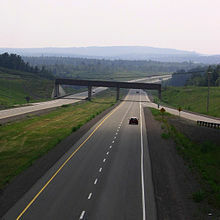 Sections routed along 400-series provincial freeways feature a higher limit of 100 km/h (62 mph).